Industry Experts, Inc. introduced an updated 2018 version of its global market report on Medical Nutrition. 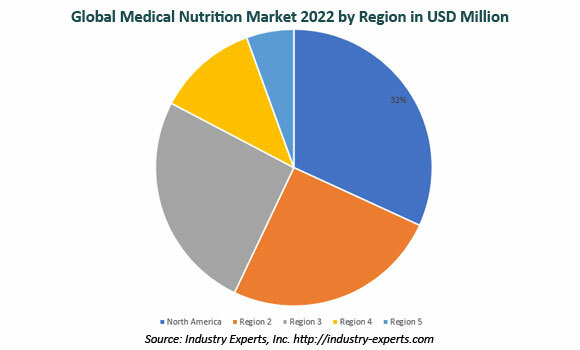 As per this updated version of the report entitled “Medical Nutrition– A Global Market Overview“, Asia-Pacific projected to be the fastest growing market with a CAGR of 8.5% during the 2017-2022 period, enabling the region to reach US$13.4 billion by 2022. Medical Nutrition product segments analyzed in this study include Infant, Enteral and Parenteral while sub-types of Enteral medical nutrition comprise Standardized, Elemental/Semi-Elemental and Specialized. Infant Nutrition accounts for the largest share in the global Medical Nutrition market, with an estimated 2017 share of 45.5% that is equivalent to US$17 billion, followed by Enteral Nutrition with 37.4% (US$14 billion) in the same year. The report reviews, analyses and projects the medical nutrition market for the global and regional markets including North America, Europe, Asia-Pacific, South America and Rest of World for the analysis period from 2014 to 2022. These markets analyzed in terms of market value in US$. These regional markets further analyzed for 14 independent countries across North America– the United States, Canada and Mexico; Europe– Germany, France, the United Kingdom, Italy, and Spain; Asia-Pacific –Japan, China, India and South Korea; South America– Brazil and Argentina. This 382 page report includes 164 charts (includes a data table and graphical representation for each chart), supported with meaningful and easy to understand graphical presentation, of market numbers. The statistical tables represent the data for the global market in terms of value in US$ by geographic region and product segment/sub-type. This study profiles 26 key global players spanned across North America– 16; Europe– 8 and Asia-Pacific– 2. The report also provides the listing of the companies engaged in the manufacturing and supply of medical nutritional products. The global list of companies covers addresses, contact numbers and the website addresses of 666 companies.